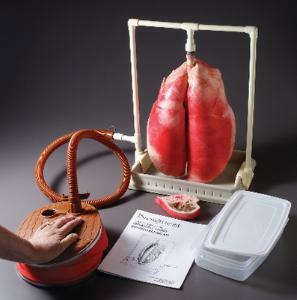 The Inflatable Lungs Kit demonstrates the touch and feel of a lung. Students learn how these specially preserved swine lungs, comparable to those of humans, work by inflating and deflating them with a pump. Each kit comes with a section of dried lung to show internal bronchi and vasculature. The lungs in the Smoker’s Lungs Kit are stained to demonstrate the effects of prolonged smoking and contain palpable simulated tumors. Each kit measures 13 x 8”. 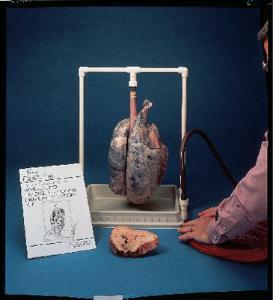 Ordering information: Each kit comes with a section of dried lung, an inflation rack and tray, air pump; one pair of reusable and inflatable swine lungs, a container for storing the lungs, and a teacher’s guide. The lungs in the Smoker’s Lungs Kit are stained and have simulated tumors. The Comparison Kit comes with one pair of normal lungs and one pair of simulated smoker’s lungs.